Comunidad Crecer, meaning "community for growth," is a small private school outside Mexico City dedicated to assessing and educating children with multiple handicaps. 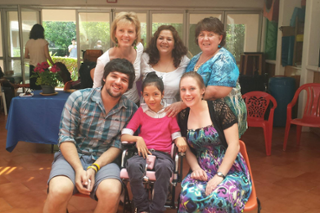 Since 1990, students, supervisors, and faculty members from the UNM Department of Speech and Hearing Sciences have traveled to Comunidad Crecer to provide treatment for students with communication difficulties and other handicaps resulting from cerebral palsy and a variety of genetic syndromes. Since 2001, SHS has collaborated with the UNM Occupational Therapy Department. Students serve as members on a multidisciplinary team including occupational therapists, physical therapists, and the school staff. Gaining a place on the Mexico City trip is competitive. Housing for the trip is provided in a dormitory attached to the school. Parents of Comunidad Crecer students host the visiting team for tours, entertainment, and meals. Traditionally, the graduate students' only expense is one-half the airfare to Mexico City with University and Department clinic funds covering the remaining costs. The Comunidad Crecer project is an example of true collaboration and a cultural exchange. It provides a wonderful opportunity for graduate students to get to know people from a different culture, practice their Spanish skills, and benefit from the hands-on experience of working with students with a wide range of handicaps. For more information on the project, please contact Clinic Director Dr. Sandra Nettleton.